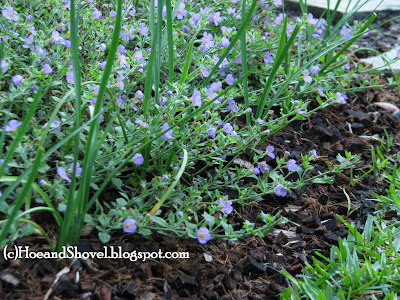 No question about it ~ mulch is an absolute must-have in the garden. Whether landscaping or vegetable gardening the benefits are similar. In Florida there are two highly popular types of mulch: Cypress mulch and Pine Bark mulch. I haven't used either one for many years. My personal choice of mulch for my entire landscape and natural pathways is oak leaves. I wrote about it here last year. They are free falling from my canopy of oak trees which makes them very affordable. Some folks argue they don't like the aesthetic nature of leaves used for mulch. I do like it because it adds to the natural appearance of my landscape. Not only that but it has proven over time to be an indisputable benefit for adding organic matter to my existing soil as it breaks down. AND oak leaves are environmentally friendly. Why Kill a Tree to Grow a Flower? From the Florida Native Plant Society: Almost all of Florida's old-growth cypress forests are gone now. They were clear-cut for lumber decades ago. Most of the cypress stands we see today are relatively young trees. Cypress mulch used to be produced mainly as a by-product of lumber operations, but the increasing demand for mulch has led to the use of whole trees - whole forests-- for nothing but mulch. The old-growth cypress harvested prior to the 1950's had a reputation for being rot and termite resisitant. But those trees have all been taken except for the few saved in our nature preserves. It takes hundreds of years for a cypress tree to grow the heartwood that used to have those properties. The young cypress that are harvested today are not decay or pest resisitant and do not make superior mulch . Hearing quite a bit recently about coconut fiber mulch (or coir) made me want to give it a try. It is touted for its high water absorption and retention capacity... and get this... the #1 reason ... it is reported to repel snails! Reason enough for me to give it a whirl. The original Mulch Block is a little bit pricey so I thought I'd trial it starting with just a couple of blocks. The least expensive place I could find it was at Mountain Valley Growers ~~~ they have some other great stuff too ~~~ in case you were wondering. It is packaged in lightweight, condensed blocks. Water it down in a container. I used my trusty wheelbarrow. Leave it alone to soak up the water while you do some gardening. It might have to be broken apart a bit during the soaking time as it comes highly compressed. 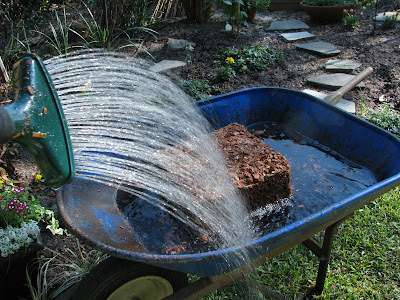 In a short 20 minutes or so later you'll have a wheelbarrow full of mulch to easily spread. I had enough to cover the external edging of the entire veggie garden where flowers are planted. I waited until the flowers were good and established before mulching ... approximately three weeks after planting. So far I am happy with it. It has been in place about six weeks. The true test will come after a longer period of time. But I will say, handling it was easy and I do think it is doing the job it was meant to do. Grass Clippings ~~ personally I don't use them often. They can mat and mildew if too thick. I like to add them to the mulch pile and let them break down first. Pine needles ~~ Pine needles acidify the soil slightly which helps some food crops and is useful around delicate flowers. Newspaper, black plastic, other garden fabrics ~~ I've used newspaper layered under oak leaves which is working well for my tomatoes this year. Be sure to leave a large opening around the base of the plants for water absorption. I am not a fan of plastics or fabrics... but that's just me. It is recommended by some sources. Pine Bark ~~ Not a fan here although I do like its appearance better than cypress mulch. It is used in large scale in this area. Pine bark is a by-product of the timber industry so it trees are not being harvested solely for mulch. Very slow to decay... it is very effective in weed and seedling control. Melaleuca Mulch ~~ Is an invasive non-native tree that has taken over 500,000 acres of the Florida Everglades. Turning this tree into mulch helps rid the state of this terrible pest plant. It is more expensive than cypress (I'm thinking this has to do with demand). It is reportedly extremely long-lasting and termite-resistant. It is not easily found either at the big box stores or at local nurseries. Lack of knowledge is my guess. A few more alternatives I can think of at the moment ~~ Pine Straw, Eucalyptus Mulch, Peat Moss, Straw, Hay... none of which I have made use of in my garden. Here's My Question For YOU? Last year I didn't mulch my vegetable garden. Can you believe it? Call me crazy. The reason: I wasn't confident about what to put next to my precious vegetables. It was intensively planted so I think that might have saved me. The weeds were not horrible but I was a slave to watering it almost always twice daily. The upside: I never had to guess when it needed to be watered. I could watch it dry out before my very eyes. 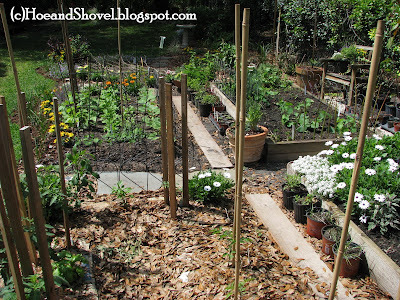 This year I haven't mulched the veggie garden yet except the newspaper and oak leaves I put in the tomato plants bed. The only reason I felt comfortable doing that was because the oak leaves were on top of the newspaper. a) I'm not sure if ALL the vegetables will like it. Oak leaves do break down adding acidity. b) It seems chancy there could be bugs and seeds hiding in them waiting to do damage (something I don't worry about in the landscape). The companion planting book I'm reading and have recommended on a previous post suggests using straw... BUT strongly suggests against using hay (due to seeds that germinate). Straw is not a commodity easily found in our area. As a matter of fact I haven't been successful finding a resource for it online even. My second thought is to order some pine straw to be delivered to my door. It is kind of pricey, in my opinion, but it seems to be the best viable choice right now. Have any of you used it in your vegetable garden? 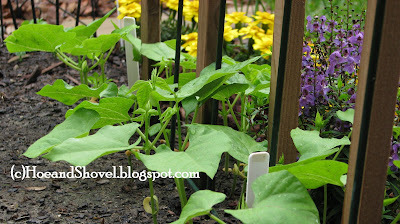 My gardening friends, do you have a tried and true mulch you recommend for the vegetable garden? Do you have one you "don't" recommend? Keep in mind I don't garden in clay but a fairly rich, well-draining soil. Any information or help in this area is welcomed. At this point all the veggie seedlings are up out of the ground and are begging for some insulation from the elements. Gardening isn't for wimps is it? There is always more to learn and more to grow! Thanks for reading and thanks for taking a moment to let me know what you think. Hi Meems, Your veggie garden looks lovely! I use shredded leaves on my vegetable beds, because they help keep moisture in the soil, are free, will eventually break down and enrich the soil. I use pine bark on my paths over landscape cloth, where it keeps the weeds at bay, and doesn't break down too quickly. The coconut fiber mulch sounds very nice and I would consider it for certain applications, just wish it were less expensive. Straw is widely available here, and works fine, but it doesn't look that great, just my opinion. Interesting read, Meems. We don't have a veggie garden (only grow flowers) --so I can't answer your question. Meems I mulch with cut grass but that has problems with the seeds and it quickly decomposes. Bark is imported and is too expensive. Gardeners down here used to use Bagasse a sugarcane by product but it has to decompose a bit before using or it is too acidic and a breeding ground for fungus. I have loads of old coconuts but I do not have a chipper. To buy the imported expensive coco mulch I will have to win the lottery LOL so I am trying to see how I can chip up my old coconut pile. I also have loads of ficus tree leaves but it is too windy to put them down. I put them in my compost heap. Your oak leaves seems like the best to me. I haven't mulched a vegetable garden. In the perennial beds, I use my own leaves, like you do. I've also tried the coconut coir in compressed blocks, and they worked fine. Around the side of the house, where it can't be seen much, I use bark chips. My favourite, other than the leaves, is cocoa shell mulch, which isn't supposed to be used if you have dogs. It has a wonderful chocolate aroma. I wonder if peacocks are attracted or repelled by chocolate? We use straw, it is easy to get here under $4 a bale. It does have seeds and we still have weeds to pull. Main reason we use it is for moisture and hide the seeds from the birds and other critters. Great post- very informative for a young gardener like me! What comprehensive research and testing you've done. Great, informative post! I mulch with hardwood mulch that I buy in bulk. They load it onto the truck and away I go. I used to have pine needles from our trees to use on a path that ran past them. No longer so I got some pea gravel for the pathway since the regular mulch washes off in heavy downpours. As to the flower beds. A newly established bed I use newpaper with mulch over it. Or even birdseed bags under mulch. They are tough and last some time. Good luck with the coconut fiber. I hope the fiber doesn't soak up all the mositure before it gets to your veggies. They say that peat does that. I have a friend who swears by it though. Oh Meems, you are so much more of a Mulching Mama than I am but Maniac you are not!! Your research is amazing and you are so right about the trees!! I stand corrected, messy, but corrected. Hi Meems, I hadn't realized almost all the old growth cypress forests were gone! Such beautiful trees, too. I use hay and oak leaves for mulch. Hubs usually picks the bales up at the feed store. In spite of the weed seeds, I LOVE hay in my vegetable garden. Actually, I especially love spoiled hay - you know the uneaten stuff with some dry cow paddies mixed in. It breaks down so quickly that after one growing season it's easy to till it into the soil. And since we have a pasture adjacent to our house, I can bring it in wheelbarrow by wheelbarrow. Of course, the fact that's it's free is another plus. Mulch under the squash and eggplants keeps the fruit from touching the soil - but I must admit I don't always get all the other veggie crops mulched. This year is an exception - all the veggies and all the herbs have a nice thick layer of spoiled hay. 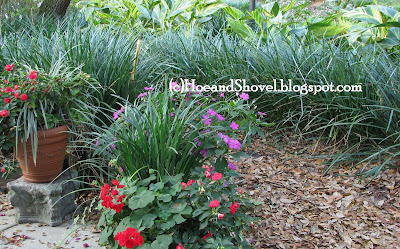 I am going to order some of that coir mulch to try. When my dad was living in St.Pete,he always used pine needles(he had quite a few pines in his yard)around his veg. garden.and had no problem with weeds.He also had a huge eucalyptus tree,which shed bark constantly,and he used that in his flower beds.He used to have enough that he could give us bags of it every month.That was great stuff. I've only dabbled in veggies but do as much as I can with flowers. I've used cypress, but like you, don't like cutting trees for mulch. Pine bark is fine but I don't really like the hard look of it with frilly flowers or the fact that it can attract bugs. Lately I've been using pine straw. It is a little pricey but it spreads fairly well, looks great and keeps the weeds at bay as much as it retains moisture. I get it at Kerby's Nursery in Brandon. We use hay to mulch our veggie garden, but we're lucky to have plenty of it here on the farm. If hay is cut before it goes to seed you don't have the reseeding problem. Which is not to say we don't have weeds :) Not all hay is cut when it should be! But we put it on in thick slices and that works well. It also makes the soil wonderfully rich as it rots down. 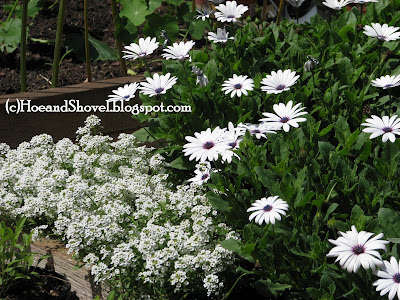 I don't mulch my flower gardens because with so many it's just too expensive. I consider weeding and watering peaceful and relaxing passtimes, but they do take far too much time that I could be using to thin out the perennials, and many other gardening chores. I wonder if the grass clippings might be less prone to mildew if placed on top of newspaper. Your veggie garden looks so pretty. I love the marigolds and other flowers interspersed. What's the taller purple flower? I usually use ground up leaves too. When the plants fill out you can't see much mulch in my garden. Haven't heard of Melaleuca, interesting and it seems like a good idea. Straw isn't easy to find anywhere. 90% of farmers don't bother to bail it or they want to leave it on their fields to decompose. i would think using the leaves since they work around the rest of your garden is the best idea. we use a soil conditioner which is mulch finely ground up. i really like it. but this year we are making a barrier around the edges of garden to keep the weeds at bay(or at least in theory).we will add some kind of rock like pebbles. i am going to use straw as well. under the corn we are going to grow a living mulch like buckwheat or alfalfa. 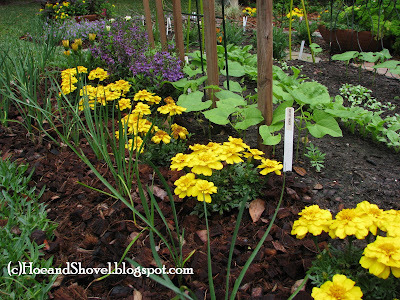 as you well know reading the companion gardener planting heavily is another good option. hope your coconut fiber does well. we have a wine maker up here that uses it in the process of making their wine. Hi Meems- great post. 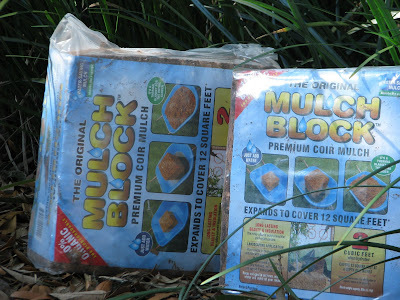 I have been thinking what to use for mulch since I no longer use Cypress. I use oak leaves as well, since I have TONS of them. But I like the idea of the coconut husks. I might have to give that a try. Take care! Loved reading all that information Meems. I use grass clippings and leaves from the few trees that I have. That is an interesting mulch cube Meems. I've never seen anything like it before. 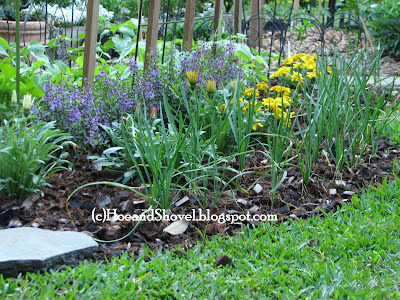 I always used grass clippings to mulch my garden with and haven't had any problems. But that's in an arid climate with 20% or less humidity. Good luck finding something that works for you this year. I use hay/straw in my veggie beds. I buy the bales in the fall for fall decorations, then place the whole bale in the veggie garden until the spring. Then walah! Any weed seeds that do germinate are extremely easy to pull and it is never many. I prefer the straw to all other mulches because it is light and fluffy and easy to work with and looks right in the veggie garden. I of course put newspapers under it. I, like you, use only oak leaves in my other beds. I am in heaven as a neighbor several houses down has a pile of mulched composted leaves in a pile 20 feet long and about 4 feet high. He usually burns them but I asked them for them. He kind of gave me a hard time in a funny way but said I could take as many as I want. Gotta love the leaves! Now if I could just get that truck. I have noticed an increase in acidity but if I have a plant that likes sweet soil (like peonies or clematis I just add a bit of lime or wood ashes. Works like a charm. Thanks for a very nice post Meems. I wish more folks would use what they have in their garden already. The big joke is gardeners pay someone to haul off their yard waste only to pay someone else to haul it back in a different form to mulch their beds. Go figure. Thanks everyone for your great comments and feedback. We actually got a little bit of rain here today. This is the third year in severe drought conditions and spring is our dry season. So even though it wasn't much - it is welcomed. It was enough to run me out of the garden twice today. I got rained out this morning and came inside and then rained out on my second attempt again this afternoon. Sounds like a lot of rain but really just enough to get me soaked to the skin. I worked in it for a while and then decided it was just too sloppy. So many different thoughts and ideas and uses for mulch. It is apparent that specific parts of the country/world have access to particular mulches more readily than others. Some like Helen in Barbados are limited by what is imported at a higher cost. I had to chuckle wondering as NorthernShade suggested if peacocks are attracted to or repel cocoa shell mulch. I have heard it mildews badly down here. The purple flower you asked about, Kerri, is Angelonia angustifolia hardy in zones 9-11. It is new to me although I've had my eye on it for a couple of years. Decided to give it a shot in the veggie garden as bees are attracted to it and it can take our summer humidity. You all are the best! Any more thoughts keep them coming my way. we have never mulched the vegetable garden, but we mulch the flower gardens all the time. Never even thought about mulch for the vegetable garden. I learn so much from my blogging friends. I'm definitely learning a lot from you, the way you're labeling the plants/ flowers. Our county park offers free mulch that has composted down quite nicely. I've used that in the vegetable garden with some success. I just have to watch out to see what's in the pile at the time. The cons: I've had to watch for weeds that spout in the mulch itself. We can't use pine straw as my hub is too allergic to it. I put down pine bark mulch in parts of the garden about 3 years ago and it still looks great. I use that in some areas of the yard. I'm curious about the oak leaf mulch with the vegetables tho. Is it too acidic for some of them? I know it does make great mulch otherwise. I've heard that roses love it! And last but not least, I've read about the coir on several garden websites but since I haven't seen it locally, I haven't used it before. Thanks for the tips! What about using that as a mulch in your veg. garden? On the west coast we use fir bark mulch, a bi-product of the timber industry. It works the best in my experience. I've used straw, it worked well for the summer, and then we pulled it off and put it in the compost bin in the winter because it was starting to get a bit nasty. It wouldn't be a problem to use oak mulch around here, but our soil is a bit alkaline to begin with and we have a different kind of oak tree. 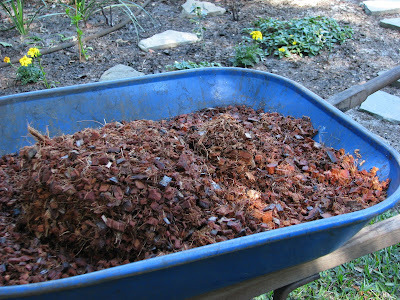 Another mulch we have around here is shredded redwood mulch. It takes a long time to break down and does not feed the soil like a normal mulch. It works well for slopes, but is terrible for flat ground. Contractors and non-gardeners and Home Depot customers use it, while gardeners all hate it. That is the ONE thing I absolutely LOVE about blogging... learning so much from others. so glad you visited... pleasure to meet you. YOur question about oak leaves offering too much acid to some vegetables is my question too. I don't know the answer... more trial and error I suppose. The coir mulch in the veggies seems a little too chunky. Not sure it would do well around the tender stage of the onions for example. YOu have very different trees on your coast than we do... fir and redwood... sounds like you have it figured out - what works well. Thanks for the comment and all the good information... glad you stopped by. After this, I will NEVER use cypress mulch. Thank you. I like to use pine straw. I think it looks nice and clean. It is easy to use and helps keep the weed out. It is natural. Plus it does not cost much.